Government spending is out of control, now seeing record new heights. What will this mean for the the economy? On Monday, the U.S. national debt jumped a record $339 billion in a single day following President Obama signing into law new legislation that sees the debt ceiling suspended. Imagine that, our monetary problems “solved” with the single stroke of a pen. The Treasury Department can now borrow as much money as it wants above the previously stated $18.1 trillion limit. Following the move, the total U.S. national debt moved to $18.5 trillion. 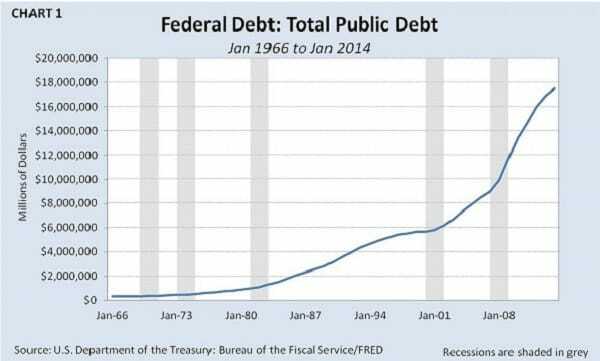 So now, by the time Obama leaves office in 2017, the total debt is estimated to reach a staggering $20 trillion. To put things into perspective, when Obama took office in January of 2009, the total national debt was $10.6 trillion. Now, the debt has almost DOUBLED in the space of two presidential terms! This is not in any way, shape or form a healthy economic situation. Each time our nation reaches its debt ceiling, the Treasury Department undertakes “extraordinary measures” to keep the government afloat. At the end of 2012, when the debt ceiling was hit, measures were undertaken to keep the limit from being breached; and as soon as the limit was increased, the debt jumped $100 billion in just nine days. In mid-2013, we again saw the same thing, with desperate measures undertaken to keep the government solvent. A day after the debt ceiling was increased that time, the debt shot up by $300 billion. This time round, according to the Bipartisan Policy Center, the government had a whopping $370 billion worth of extraordinary measures up its sleeve. Looking at the government receipt from all their spending, this is getting rather expensive. Now all this would be a non-issue if there was a plan to actually reduce or pay back the debt. But as things stand right now, it seems as though our representatives in Washington don’t have the slightest intention to ever pay back the debt. In fact, our government is increasingly expanding, spending more and more, and looking at new ways to gain more access to larger streams of income. They’re accessing more money through taxation, borrowing, money printing or simply taking from pension funds. So, is there really a debt limit? For all intents and purposes, the simple answer is no. How could there be when the ceiling is raised every time we hit it?! There seems to be no end to this cycle. Plus, our representatives are further emboldened by the U.S. Dollar’s current position as the world’s reserve currency. But as the universal rule known as Stein’s law states, “Things that can’t go on forever, don’t.” And by the latest indications, the dollar’s reign as global reserve currency appears to be coming to an end. At some point the debt will grow to such an astronomical level that confidence in the system will be completely lost. So unless you see a solution to the nation’s debt crisis that no one else does, then take this as your chance to get in ahead of the crowd and move to safety. Historically speaking, when confidence in governments and the economy wanes, people move towards “safehavens”, such as gold. By all of these indications, now may be just the time. The Fed has also run out of options to help the economy. Read why here. 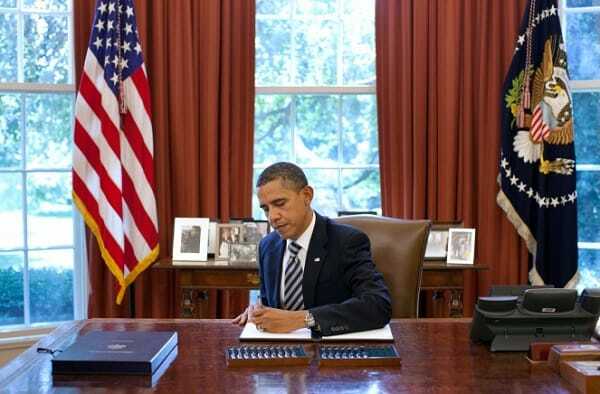 Photo credit: Obama signs Budget Control Act of 2011” by Pete Souza – http://www.whitehouse.gov/photos-and-video/photogallery/debt-and-deficit-negotiations. Licensed under Public Domain via Commons.